The lymphatic system’s primary function is to isolate infection and debris and transport it through filtration points called lymph nodes. Another important function of lymph tissue is generating and storing white blood cells, which fight infection. 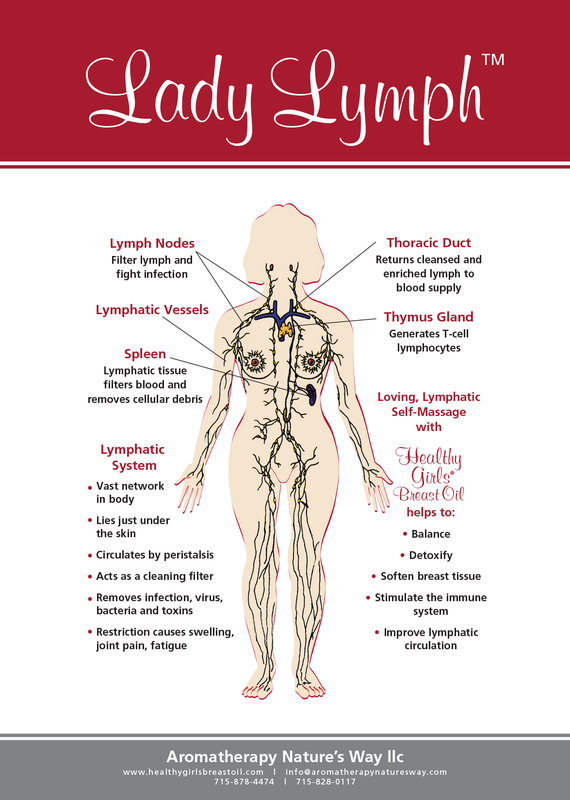 The lymphatic system supports every system in the body. Taking proactive measures means commitment. Learning the benefits of quality essential oils, early detection, and applying a loving lymphatic breast self-massage are all proactive ways for you to nurture and protect your long-term breast health. Women find this massage reduces breast pain, inflammation, lumps, cysts, and fibrocystic breast tissue, relieves PMS breast symptoms, and may reduce fear of complications. The key to good health and cancer prevention lies more in your hands than you may think. What you eat and put on your body, how you feel, what you think, and even what you believe affects your breast cancer risk. Traditional medicine may say these things don’t matter, but the truth is … they do. Do you really think a monthly exam and a yearly mammogram, only after you are age 45, will prevent any abnormal cells from developing? Doesn’t it seem logical to spend time every day to take steps in preventing a surprise diagnosis of cancer?